Newlyweds' lavish honeymoon featured a relaxing swim in world's highest infinity pool in Singapore and a private butler in Bali! Wanting to stay in their wedding bubble for as long as possible, newlyweds Laura and Paul Fortune opted to head off on their honeymoon within a week of their big day. The couple spent 18 days in August 2016 visiting Singapore - where they stayed in the famous Marina Bay Sands - and Indonesia, where they visited the islands of Java and Bali. They chose Asia, wanting somewhere 'special' with 'a good dose of sunshine', and spent their time sight-seeing and experiencing the local culture, as well as relaxing in some of "the best hotels they've ever been to" - including one featuring the world's highest infinity pool and another villa boasting its own private butler. "We get bored easily so a two week holiday on a beach isn't for us," says Laura. "This gave us the perfect mix of relaxation and seeing the sights." They booked the Indonesian leg of their journey through Ultimate Journeys, based in Saintfield, County Down, and their Singapore bookings were made by themselves. Laura and Paul flew with Emirates from Dublin to Singapore Changi Airport - a 15.5 hour flight. When it was time to move onwards to Java, they took a domestic flight with SilkAir from Singapore to Yogyakarta, Java which took two hours. For the last leg of their honeymoon, the couple travelled with Garuda Indonesia from Yogyakarta to Bali, on a flight that took one hour. 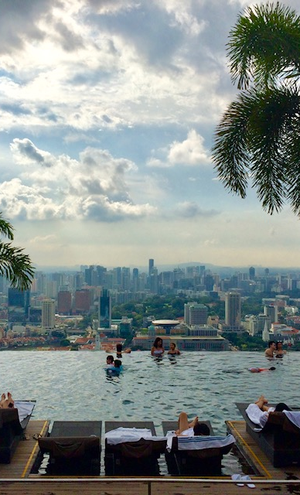 While in Singapore, Laura and Paul stayed in the fabulous Marina Bay Sands. They emailed the hotel before telling them it was their honeymoon - which Laura recommends fellow newlyweds do before they go! - and received a room upgrade with views over the entire bay, as well as daily room gifts. "On our first night we went all out and went to a chocolate, cheese and champagne buffet in their Club55 restaurant with panoramic views of the city at night... I mean what’s not to love?!" says Laura. "The biggest pull of the hotel however has to be the infinity swimming pool at the top of the hotel - it's the world's largest and highest!" Laura and Paul stayed in the 5* Hyatt Regency while in Yogyakarta, which they say was great value due to Yogyakarta's relatively less 'touristy' nature. "The hotel is inspired by the beautiful temples that surround it and boasts stunning views of Mount Merapi and beautiful tropical landscaped gardens," Laura notes. "They host event nights like the Ramayana Night Market where you can enjoy traditional dancing and a BBQ out on the terrace." Laura describes their third hotel of the honeymoon as the one with the real 'wow factor'. "It is hard to describe the natural beauty of the Royal Pita Maha. Each luxury villa felt so private almost hidden amongst the valley of lush tropical greenery. The villa had spectacular views of the tropical area and gorgeous traditional Balinese features including a four poster wooden bed, spa style sunken bathroom and a separate living room. We even had our own private infinity pool and sun terrace which was so secluded you felt like there was no one else around you. There was complimentary afternoon tea on the stunning terrace daily and early morning yoga sessions by the Ayung River. There was also a free daily shuttle into the heart of Ubud which was so convenient! The staff here were so friendly and welcoming- they gave us gifts of sarongs and a hand carved traditional wooden jewellery box and a desk sign for Paul - although he doesn’t have a work desk for this!" After staying at the Royal Pita in Ubud, Laura and Paul clearly got a taste for the finer things, and decided to upgrade from the main hotel to a villa, and were glad they did. "We could have moved in - it was out of this world! The villas boast a large bathroom, indoor and outdoor showers, four poster gorgeous bedroom, large living room, plunge pool and cabana outdoor beds, and not forgetting the butler who you could call with your private mobile! With the villas you had breakfast at Dava, where you could ask for whatever you wanted and they made it for you - the breakfast of dreams! There was also complimentary access to one of the world’s largest aquatonic pool and a massage at Spa Thalassotherapy. I was so relaxed I left my phone in the spa and felt in a dream like state for the rest of the day! There is complimentary shuttle access to Rimba Jimbaran Bali where we took a cookery course, drinks vouchers included to spend at the famous Rock bar with the best sunsets you will ever see and the most beautiful private beach for guests only. "A particular highlight was visiting Yogyakarta to see a more real side of Indonesia. The people were so happy that you came to their country to visit, wanting to take photos with you and helping teach the local children English. The temples of Borobudur and Prambanan need to be seen to be believed and learning all about Buddhism culture was truly beautiful. We definitely recommend our private tour guide who went out of her way to show us everything Yogyakarta had to offer- even if some of the food was questionable! We loved learning about different cultures and ways of living and it can be a humbling experience." 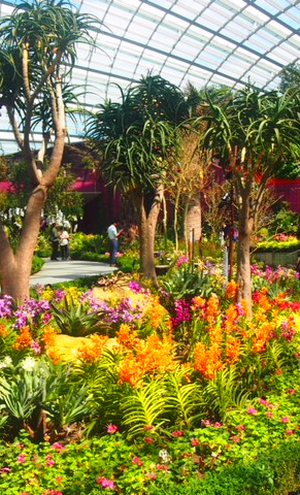 "If you are in Singapore the gardens by the bay are a must, try to see it during the day and when they come alive with light and sound at night. It is also worth visiting the different areas of the city such as Chinatown and Little India and Arab Street to get a real feel of Singapore’s people. You of course need to get the Singapore Sling cocktail from Raffles Hotel where it was invented!" "It's all about the temples here. The Buddhist temple of Borobudur and the Hindu temple of Prambanan are spectacular! We also did a jeep tour of Mount Merapi - the most active volcano in Indonesia. It is devastating to see the effects of this volcano on the local villagers and you can see it constantly smoking at the top. We also went to the Kraton of Yogyakarta which is the palace of the Sultan and also contains a Javanese culture museum. We also got to try our hand at some local activities including Batik fabric painting and making traditional Javanese food." "Ubud is the cultural centre of Bali," says Laura. "Here we went to the Sacred Monkey Forest where monkeys roam wild through the greenery and temples. We had a guided tour through the countryside visiting Mount Batur, Kintamini lake, Mas a wood carving village, the elephant cave, visited a coffee plantation and of course the famous Tegalalang rice terraces." "In Jimbaran Bay we choose to relax mainly at the hotel. We did see the famous Uluwatu Temple on the cliffs and then followed with a sunset performance of Kecak Dance. We also headed to the local beach for a seafood dinner at night." 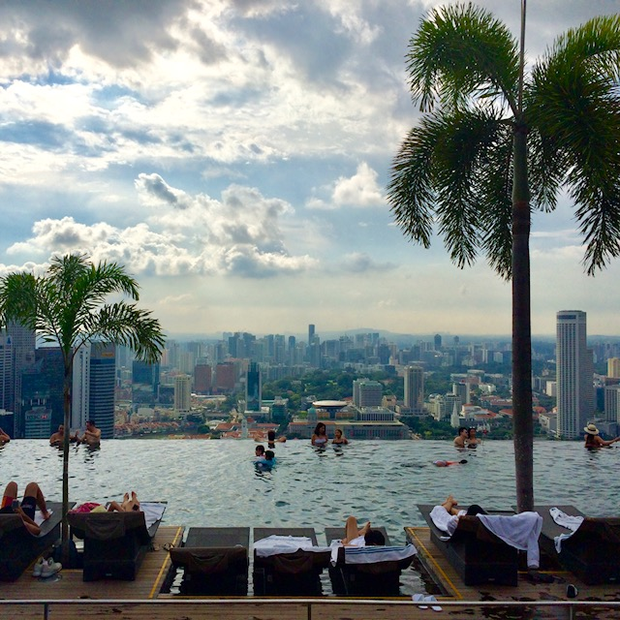 Singapore - "We really recommend Adrift by David Myers in Marina Bay Sands. They do a surprise tasting menu which was delicious!" Yogyakarta - "There was limited good food here but the Sasanti Restaurant next to the Hyatt Regency served tasty Indonesian food." Ubud - "The city centre has many quirky cafes and restaurants due to the tourism. We loved Mozaic for fine dining in such a romantic setting- after eight courses though you’ll need a lie down. Another delicious restaurant was The Bridges for dinner and we loved a little café called Watercress for yummy lunches." Jimbaran Bay - We really recommend dining in Ayana Resort - there’s so many to choose from. We loved Dava Grill for delicious steaks! "You’re only on honeymoon once, so enjoy every second of it and do what you want!" says Laura. "Also make sure you tell everyone it’s your honeymoon for the extra perks - everyone loves a freebie!"